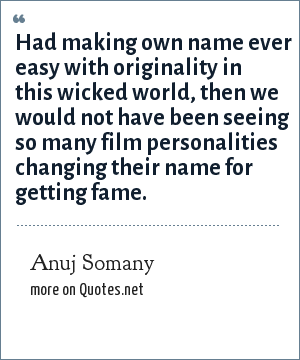 Anuj Somany: Had making own name ever easy with originality in this wicked world, then we would not have been seeing so many film personalities changing their name for getting fame. Had making own name ever easy with originality in this wicked world, then we would not have been seeing so many film personalities changing their name for getting fame. "Anuj Somany Quotes." Quotes.net. STANDS4 LLC, 2019. Web. 25 Apr. 2019. <https://www.quotes.net/quote/71353>.